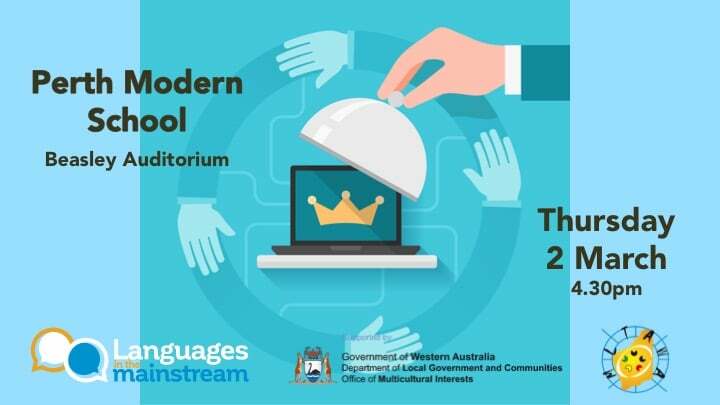 The Languages Week Competition Launch was a free public event held at Perth Modern School on 2 March. The session provided information about how to enter Languages Week competitions, network, and catch up with the latest in Languages education. Produce a bilingual text film or e-Book. Open to WA school aged students who are bilingual or have a background in a language other than English. Community language teachers, Aboriginal language teachers and EALD/ESL teachers can encourage their students to take part in this competition or incorporate into their teaching/learning programs in 2017. Submit photographs from your landscape/environment which represent the diversity of living languages in our community. Open to all WA school-aged students. Provide email or online written responses to interview questions about how language learning has changed your life. Open to any WA resident of any age group. Don’t know how to produce a film or e-Book? No problem – you can book into our Term 1 (1 April) and holiday (11 April) workshops and we’ll show you how. Languages in the Mainstream is a partnership project between the MLTAWA and the Office of Multicultural Interests. Comprising of a series of public forums and initiatives to promote language learning and celebrate our society’s cultural and linguistic diversity, the project will culminate in the state-wide acknowledgment of Languages Week 7-14 August, 2017. I Congratulate for this new Project and for the opportunity to bilingual people express themselves and their backgrounds / cultures on their own languages. We have roots that will never can ride off. Cultures that helps Australia grow rich on resources and knowledge. Thanks Rocio. Indeed, our linguistic and cultural diversity makes us rich and is an asset to our life. Looking forward to hearing the stories told through many languages.